Kumbh Mela is the largest spiritual gathering on the planet which takes place every 12 years. The last major Kumbh Mela took place in 2012. 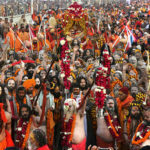 2019 is the year of the Ardh (half) Kumbh Mela celebration, a smaller version which occurs every six years. The location–at the confluence of the Ganga, Yamuna and mythical Saraswati rivers–is considered holy.